Wader Quest: Happy New Year and thank you for making 2014 a great first year for Wader Quest - the wader/shorebird charity. 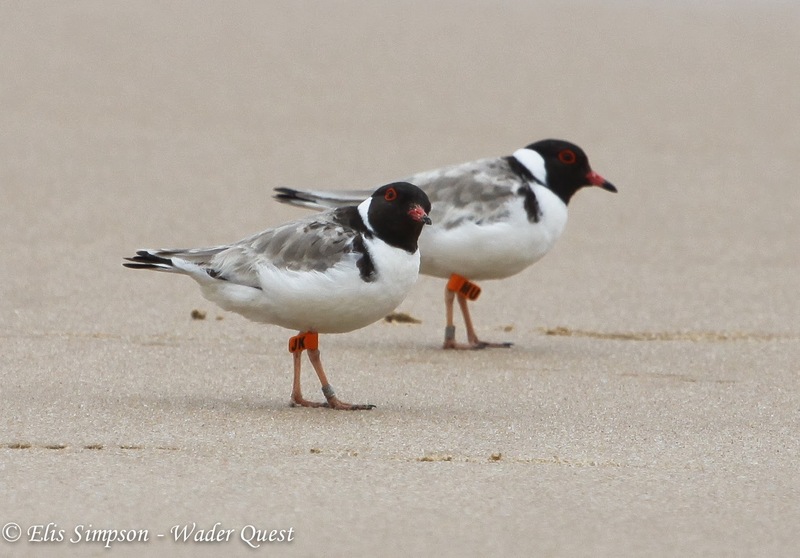 Happy New Year and thank you for making 2014 a great first year for Wader Quest - the wader/shorebird charity. In 2014 Wader Quest stopped being about Rick and Elis Simpson and started being about YOU our sponsors and supporters! And look what we have achieved together this year! We concluded our fundraising for the Spoon-billed Sandpipers raising £3,526.06; thanks to everyone who contributed! Spoon-billed Sandpiper which has changed its scientific name from Eurynorhynchus pygmaeus to Calidris pymaea. Pak Thale, Phetchaburi, Thailand. November 2012. We concluded our fundraising for the Hooded Plovers raising £1,128.50; thanks to everyone who contributed! Hooded Plover Thinornis cucullatus (formerly rubricollis). Mornington Peninsula, Victoria, Australia. September 2013. In March we wrote a constitution and declared Wader Quest as a small charity. We retained the name and logo as they were already established, we recruited some help in the form of Trustees (Allan Archer, Lee Dingain, Chris Lamsdell, David Lindo, Oliver Simms, Martin Simpson, Rachel Walls) and we set to work to continue to raise money and awareness about our favourite group of birds. We set up a sponsorship scheme so that people could join Wader Quest and feel part of the team with rates starting as low as £5.00 per annum. 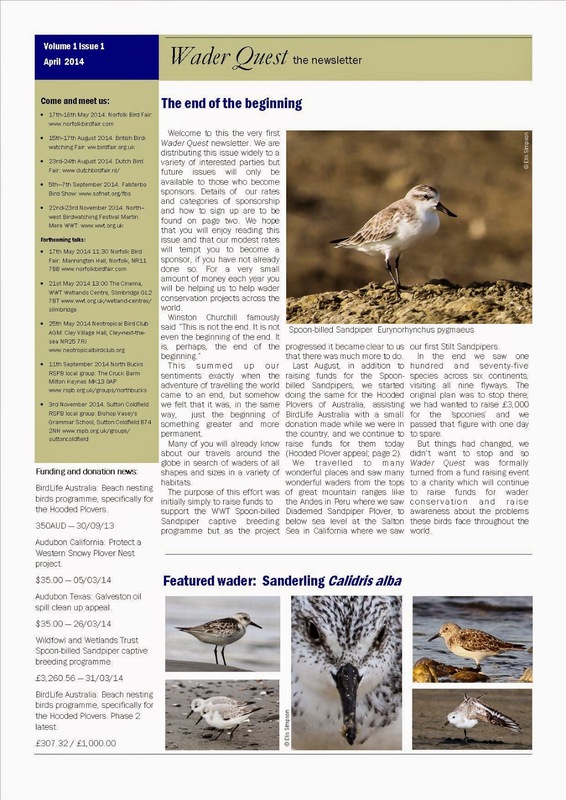 To go along with the sponsorship we created and published the first three issues of Wader Quest The newsletter, an e-newsletter for sponsors with information about Wader Quest's activities and in addition many fascinating articles by guest writers about wader conservation projects around the world. We also started asking around for second hand items that we could sell at car boot sales and labelled our stall as the Wader Quest Mobile Charity Shop and this has proved very successful in bringing in much needed cash. The mobile charity shop has brought us some much needed income. Although we are still unable to register with the Charities Commission we made a successful application to Her Majesty's Revenue and Customs (HMRC) for recognition as a charity and although this was a frustratingly long wait we were finally declared a charity for tax purposes in September which means we can now claim Gift Aid, an important source of additional revenue for us. We have now provided the first equipment for the Magellanic Plover project in Chile in the form of mist nets. Ricardo Matus in Chile should soon be ringing the first Magellanic Plover Pluvianellus socialis for the project. We have also set up a Grants Fund from which we will purchase equipment and other items for conservation projects. 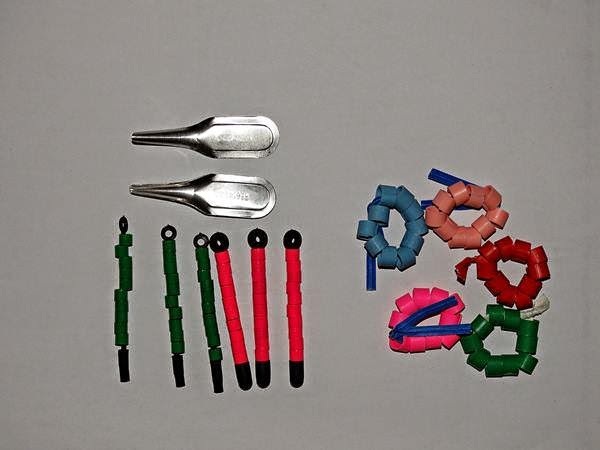 We are delighted to have been able to make our first purchases and send them to where they were needed; some rings and measuring equipment to Indonesia and some mist nets to Peru (following checks on permits and authenticity of projects etc). We attended a number of events in 2014 including the Norfolk Bird Fair, the British Birdwatching Fair, The Dutch Bird Fair, The Falsterbo Bird Show (Sweden) and the Northwest Bird Watching Festival at Martin Mere all of which we thoroughly enjoyed and were very successful for us in terms of income and exposure, we also gave talks at most of them and nine other clubs and societies throughout the year. Wader Quest at the Falsterbo Bird Show in Sweden . September 2014. 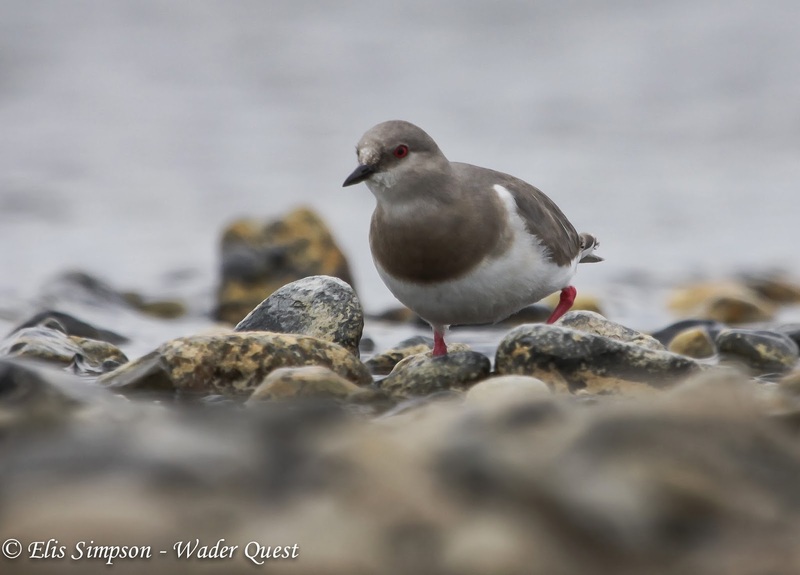 At the end on November we held our first Wader Quest Anniversary World Watch, known simply as World Watch. We were very pleased with the support we received from around the world with 116 species seen collectively, a good total for us to try to beat on 7th and 8th November 2015; make a note in your diary now! In South Africa Sue Oertli of the Wader Quest South Africa team set a task to photograph as many of the wader species that she could in 2014 as part of her Gauteng Challenge. In doing so she raised a considerable amount of money which she generously sent to us in advance based on pledges she had received from supporters. We would like to thank everyone who has supported us this year whether it be financially, in spirit or by lending us their precious time and energy. We have come a long way since those days when we decided to go and see a Spoon-billed Sandpiper while we still could, and that is entirely down to you, our supporters, friends and family who have seen us through thick and thin, witnessed our highs and lows and given us encouragement when needed. We could not have achieved any of this without the overwhelming support that we have received and for that we will always be very grateful. We decided to treat ourselves to celebrate our successful year. We wish everyone a successful and healthy 2015 and look forward to the challenges it will bring us.